After many weeks of guiding your marijuana plants through grow and bloom phase, you’re ready to harvest. Harvesting is just the first step in a multi-step process that makes your buds ready to use and ready to market. These steps are: harvesting, trimming, manicuring, drying, and curing. Today we’re focused on harvesting, trimming, and manicuring, not because those steps have to be done at the same time, but because they can be done at the same time OR they can be done a few days apart, and they influence each other. I’d also ask you to consider that even though myself and other marijuana growers often use the terms trimming and manicuring interchangeably, there is a clear distinction between them. In my view, trimming is what you do when you cut the large leaves off the plant. Manicuring is the detail work…the actual sculpting of the buds. Of the two, manicuring comes after trimming, and requires more care and artistry. 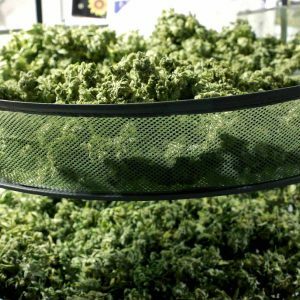 Of course, one of your most important choices is when to harvest, and you can read a great article about marijuana harvest timing here. The other choice is how you harvest. In general, this means do you cut the entire plant and hang it upside down from a clothesline, drying rack, shower cutrain rod, or closet dowel, or do you cut individual branches and hang them. The other alternative is to cut individual branches or even individual buds and place them onto drying racks such as the Quick Cure. This is in some ways easier than hanging a whole plant or individual branches, but it has one disadvantage: because the buds are laying on one side, they can flatten out on that side as they dry. My favorite method is to cut the entire plant and hang it from a shower curtain rod so it’s at the ideal height for me to access all the branches and buds. I spread a tarp on the floor and across the bathtub to catch trimmed leaves. I twirl the plant around to get at individual cannabis branches from all sides, and can easily see what I’m doing. My program is to trim away the large leaves and easily accessed material while the plant is still hanging and before it’s getting towards being dry. Then as the material is nearing the time when I will trim off each main stalk and separate the buds to store them for final drying and for curing, I do the closer manicure to make the buds into their final shape and configuration. You want to use professional horticultural scissors that have a very fine tip and are super sharp. You’re going to be doing some very close manicuring and may even need to probe inside the bud to cut out a leaf stem deep in the core. Good horticultural scissors are engineered so they’re comfortable for your hands. They cost at least $25 if not more and it’s a useful investment in your marijuana business. Check your hydroponics store and spend as much as you can afford on marijuana pruning, trimming, and manicuring tools. It’s worth it. You know what kind of buds you like to see when you’re buying them or seeing them on display at marijuana competitions or dispensaries. My feeling is that most people manicure too close. Yes, they create nugs that are attractive, with little wasted air space. But at the same time, they’re cutting away smaller bud leaves that are totally covered in resin glands. By leaving some of those leaves on, in an “artistic” resin-conscious way, you provide more THC and other resins, and you also provide more protection for the buds. Of course, it’s smart to trim away larger leaves, leaf stems, defective leaves, and other plant materials so you sculpt and shape the buds. 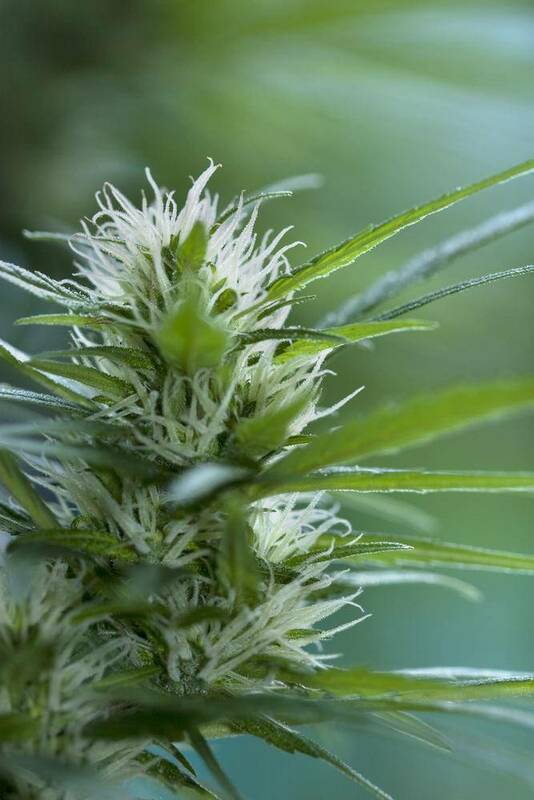 You’re careful to handle the buds properly because marijuana resin glands are like eggs and if you rupture them, the THC, CBD, and other cannabinoids immediately begin to deteriorate. 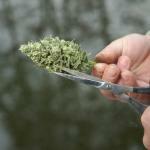 Your marijuana scissors will become resin-coated over and over as you trim and manicure. This resin is called “scissors hash,” and it’s good to use a knife to remove the hashish and store it for use. Sometimes your scissors and knife get so gummy that you can’t operate them, so you use isopropyl alcohol and a clean cloth to clean your marijuana trimming implements. Remember also that you want to go through the cut-off material and save leaves that have resin glands so you can make those leaves into bubblehash, butane honey oil, or marijuana medibles butter. One of your main choices is what will happen to your buds immediately at the time you’re finished with them. Some people trim/manicure into a bucket or other plastic containers. Because I do a long cure, I trim into glass containers, being very careful not to have the buds fall too far or too hard, or to have them too compacted or otherwise crunched up. Why? Because glass or stainless steel are really the only two totally safe materials to store buds in, and because rough handling of marijuana buds degrades THC and other resins. If your buds fall a long way and hit the bucket or bud pile hard, some resin glands rupture, and your precious THC and other cannabinoids are lost. Cannabis manicuring and trimming is an art. Of the two, manicuring is like being a hair stylist. You’re shaping the bud, removing unwanted material, and trying to create the most efficient and attractive package of resin glands and plant material. When you master the art and science of marijuana manicuring and trimming, you increase the value and usefulness of your buds, and have fun doing soothing, practical work that inspires creativity and a good feeling. Did Congress Just End the War on Medical Marijuana? Marijuana Fun: Watch Rogen & Franco Movie “The Interview” Right Now!